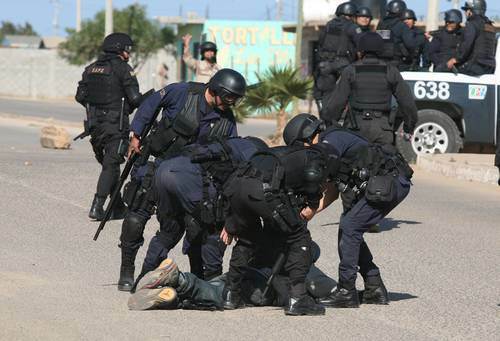 Baja California state police attacked farmworkers on strike in that state for better wages and working conditions. 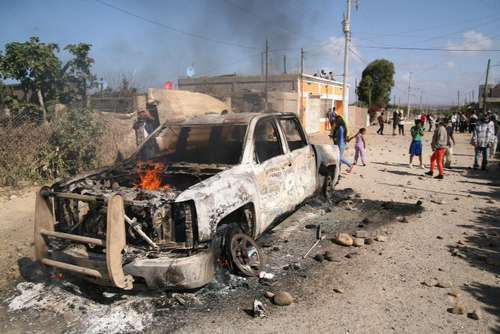 On May 9, twenty patrol cars full of police agents entered the Triqui community of Nuevo San Juan Copala, in the San Quintín Valley, under the mistaken impression that members of the Alliance of Organizations for Social Justice were there to incite some of the community’s residents to set a farm on fire. The police started to detain one person; community members came out to defend him and a few threw stones and used sticks to repel the police. The police, in turn, used rubber bullets. Police originally detained 17 people, but 12 were released. Five remain in police custody. 70 people were injured, 7 of them gravely. At the close of the Seminar on “Critical Thought versus the Capitalist Hydra,” the EZLN expressed solidarity with the jornaleros (day labourers.) Below is a La Jornada article regarding the federal government’s handling of the strike. From exhaustion to repression, from indolence to joke, that’s how the strategy that the federal government has traced for “resolving” the conflict of the San Quintín jornaleros can be summarized. Almost two months have passed since March 17th, when thousands of farmworkers from this agro-exporting enclave broke out in a general strike to denounce the savage labour exploitation that they suffer and to demand a dignified salary increase. Instead of resolving the movement’s demands, the government of Enrique Peña Nieto first gambled on its weakening and discouragement and, later, on violent contention. Nevertheless, neither of those manoeuvres has been effective for disarticulating the day labourer protest. Despite the eight weeks of struggle transpired, it maintains itself fed with the combination of moral indignation in the face of a savage model of exploitation and a cohesive and vigorous associative base community fabric. The May 9 repression shows it. 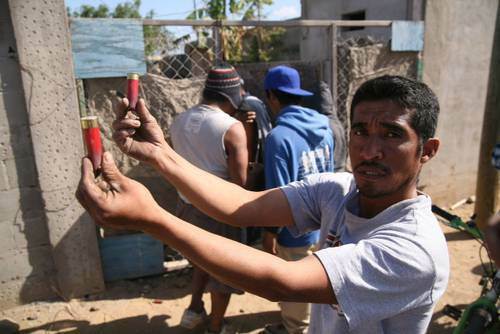 That day, using the pretext that they wanted to set fire to an agricultural unit, the state preventive police beat residents of the Triqui settlement Nuevo San Juan Copala when some of its residents were exhorting the farmworkers to maintain the strike. Residents responded by confronting the police with rage. Nuevo San Juan Copala is a colonia of San Quintín, which in 2010 had little more than 1,600 inhabitants, the majority Triquis. It took the name of the community of origin of its founders in Oaxaca. It was formally established in 1997 on lands occupied by jornaleros who were seeking dignified housing and fleeing from the oppressive agricultural camps. Since then, the collective action of its residents achieved obtaining services and basic infrastructure: orderly subdivision of land, public lighting, safe drinking water, schools and improvement of the streets. Simultaneously, it installed a figure of the Triquis’ political representation. Its residents have developed –according to what Abdel Camargo explains in Asentamiento y organización comunitaria–  a form of political and community organization that combines traditional organs of authority based on its places of origin with newly created institutions. This re-invention of tradition has permitted them to appropriate new spaces of residence, to develop collective practices that generate a strong cultural identity and to strengthen their management capacity. The standard life of the settlement, explains Camargo, is organized around three traditional figures, natives of their communities of origin. These are: the traditional authority, the community’s political representative and mediator; the council of elders, which orients and gives its opinion on the settlement’s relevant issues, and the system of majordomos, in charge of the organization and realization of the fiestas in honour of the patron saint. Thus, when last May 9 the state police repressed the residents of Nuevo San Juan Copala to discourage their struggle and send a signal to the striking San Quintín jornaleros about what awaited them, they butted heads with a vigorous community organization, constructed and forged from the heat of the struggle for almost two decades. The result of this manoeuvre was counter-productive. The violence against residents of Nuevo San Juan Copala was the last link of a failed strategy. At first, the federal government gambled on confining the struggle to the state ambit, hoping that it would die out. When the conflict was nationalized and internationalized, it had to accede to installing a negotiating commission, headed by the assistant secretary of Governance, Luis Miranda. The public functionaries dedicated themselves to confusing the work. Finally, assistant secretary Miranda put into effect operation surprise attack: without having convened a meeting between the parties, he announced a future meeting on May 8th, in which he would give an integral solution to the demands; he invented that an agreement had been reached, unilaterally closed the meeting and brought the journalists into the meeting. The jornaleros rejected that anything was agreed upon in that negotiation. The official retinue abandoned San Quintín hurriedly. Even the representatives of the Legislative Power, who supposedly attended the session invited by the strikers, acted like employees of the government and shamefully added themselves to the Executive’s entourage. Assistant Secretary Luis Miranda arrived on May 8 and left the agricultural workers in the lurch. More than 4,000 of them were waiting for him in order to hear his answer to their demands. When Fidel Sánchez Gabriel, the leader of the Alliance for Social Justice, warned him that they would stay in front of the state government offices, the functionary replied: “You don’t know me.” The next day they felt the clubs and rubber bullets of the police. Despite the nearly two months that have transpired and the repression against them, the movement of the San Quintín day labourers doesn’t show signs of physical or spiritual tiredness. It resists, fed by the conviction that one must put an end to a barbaric model of exploitation and by decades of community struggles. For the time being, it is willing to confront official indolence by organizing the international boycott of the Valley’s vegetable and fruit producers Valle.